Jordan Peele and Keegan Michael-Key are gifted comedic performers, as often evidenced from their often-brilliant sketch comedy show Key & Peele. It was only a matter of time before they made the leap to feature-film players, and Keanu is a suitable springboard for the gents that portends to even better future results. Relying upon mistaken identity bluffs, Peele and Key play a pair of relatively straight-laced men who pretend to be violent gangsters in order to retrieve Peele’s stolen kitten. Fortunately, the movie doesn’t feel like an overextended sketch though it does have its narrative detours that dawdle (a celebrity drug deal is padded out with far too few jokes), running jokes that hold on for a beat too long and then some (the George Michael fascination culminates in a drug sequence that does absolutely nothing), and there are missed opportunities that seem obvious (Key using his new gangster friends to intimidate a man making advances on his wife). Will Forte’s hip-hop loving drug dealer feels like a character nobody knew what to do with, including Forte. What doesn’t disappoint is the natural comic chemistry of its leads as well as the movie’s ability to surprise, zigging rather than zagging, and finding small jokes just as satisfying as larger set pieces. I enjoyed when the guys’ insecurity butted against their bravado, like when Peele is trying to deflect credit for helping his new pal to do some very bad things. The onscreen action is somewhere between the wackier world of 21 Jump Street and the grisly, unfunny world of Pineapple Express but at least the filmmakers realize that an action-comedy still needs to present its action through a comic lens. I was laughing consistently throughout though it was mostly at a chuckle level, if I were to be honest. Keanu is a fairly fun comedy that you can’t help but think could have been more refined during its structureless periods, but then another joke appears and it’s hard to get too upset with the final enterprise. Keanu is funny enough but you sense that a better vehicle is on the horizon for these two gifted comedians. Oh and the cat is powerfully adorable. 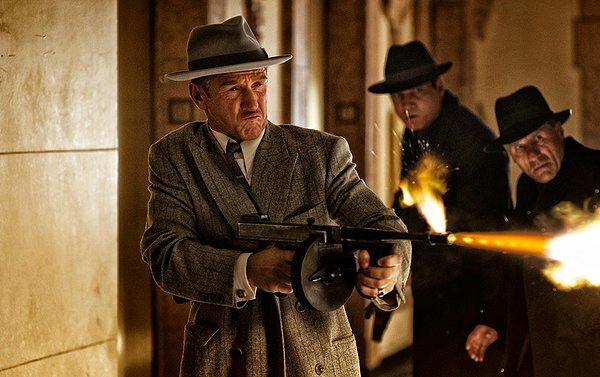 It’s hard to mention the action thriller Gangster Squad without a passing reference to the Aurora, Colorado movie theater shooting in the summer of 2012, the reason for the film’s five-month delay and reshot action sequence. Gone is a shootout at the movies and now we have a confrontation in the streets of Chinatown. I wish they hadn’t stopped there. If given the opportunity, and remember they did have an additional five months, I would have scrapped Gangster Squad almost completely and started fresh. In 1949, former boxer Mickey Cohen (Sean Penn) has seized control of Los Angeles organized crime. His influence extends even into a police, which forces Chief Parker (Nick Nolte) to go to desperate measures. He asks Sgt. John O’Mara (Josh Brolin) to assemble a team of enforcers to fight back. They won’t have badges but they will be pushed to use whatever means necessary to carry out their mission, which means blurring the line between what is considered lawful. O’Mara assembles a super group of former officers and one of them, Sgt. Jerry Wooters (Ryan Gosling) gets into even deeper danger when he starts seeing Mickey Cohen’s main squeeze, Grace Faraday (Emma Stone). This movie is like if The Untouchables and L.A. Confidential had an illegitimate child and then abandoned it in a sewer where degenerate hobos raised it. Gangster Squad rips off other gangster movies with liberal abandon that I can’t even begin to list the lifts. I’d be less offended if I felt that the movie had more on its mind than just replicating the tone and look of noir cinema. Actually, it feels more like what they want to replicate is the tone or style of the video game L.A. Noir. The main problem is that Gangster Squad really only has the skeletal outline of a plot. It’s missing any essential character and plot development. Here, I’ll summarize the barebones plot for you: Mickey Cohen is a bad guy. O’Mara forms a team. They have a montage taking out bad guys. Mickey takes out one of them. They have a showdown. That, ladies and gents, is it. There really aren’t any scenes that diverge from those scant descriptions. It felt like only five minutes passed from one of O’Mara’s guys getting killed (and just like The Untouchables, it’s the nerdy one) to them descending on Cohen’s headquarters and duking it out. Why does the film introduce the conflict of Wooters seeing Cohen’s girl if he never finds out? There isn’t even one scene presented to take advantage of this conflict. It just ends up being another half-baked plotline. It feels like the only development we get with Gangster Squad is through montages. What is also apparent is that O’Mara and his team really don’t have anything resembling the faintest notion of a plan. We watch them take out some bad guys via fights and shootouts but there’s no higher plotting to it. You get a sense that these former cops are just playing it by ear, looking for a fight every night. It’s hard to imagine that these people, even with their law enforcement and war experience, could be effective in the long term. Without any formative organization or greater planning, these guys just seem like dull bruisers bouncing from fight to fight with no sense of direction. Then there’s the paucity of character work, relying solely on genre archetypes to do its work for the movie. O’Mara is the determined family man but his team can best be described by one-word classifications: The Black Guy (Anthony Mackie), The Nerdy Guy (Giovanni Ribisi), The Mexican Guy (Michael Pena), The Young Guy (Gosling), The Old Guy (Robert Patrick). That’s about it, though I suppose they do have different weapon preferences meant to supply all that missing characterization. Oh look, Officer Harris (Mackie) brings a knife to gunfights. That’s pretty much the beginning and end of his character. Wooters is so lackadaisical he feels like he’s on drugs, and Gosling’s soft-spoken, mealy-mouthed line delivery only adds to the effect. It feels like Gosling, in a stretch to find something interesting out of the mundane, said to himself, “I wonder if I could give a whole performance where I only speak under a certain vocal register.” Then there’s the woefully miscast Stone (The Amazing Spider-Man) as the femme fatale/mol to Mickey. I love Stone as an actress, but man-eater she is not and sultry seductress doesn’t fit her well either. Perhaps with the aid of a sharper script and a greater depth of character she could rise to the challenge. At no point does Gangster Squad really even attempt to make these people multi-dimensional. They never reflect on the moral turpitude of their own vigilante justice or the ramifications of their actions. There’s no room for ambiguity here. Finally, we must speak of Mr. Sean Penn (Milk). The man’s actorly gumbo goes into campy overdrive. In these rare circumstances, you aren’t watching Sean Penn Esteemed Actor so much as Sean Penn Human Vortex of Overacting. Normally I would criticize Penn for going over the top but over the course of 110 minutes, he single-handedly becomes the only entertaining thing in the movie. He’s chewing scenery up a storm, yes, but at least he’s channeling the pulpy silliness of the whole movie. I came to enjoy his antics and outbursts and thus became more empathetic of Mickey Cohen and his efforts than I did with O’Mara. Such is the danger screenwriters run when they spend more time crafting an interesting villain than a hero. 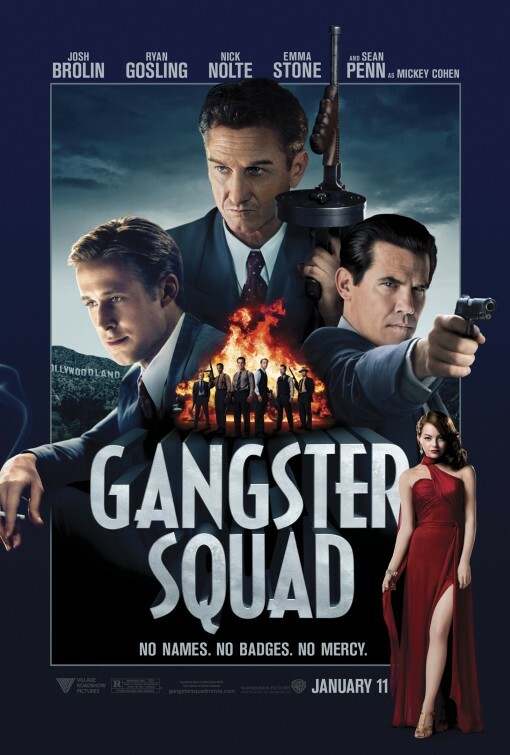 Gangster Squad is what happens when a movie is sold on title and genre elements. To be fair, it’s a bang-up title. The plot is half-baked at best, really only serving as a thin outline of a gangster movie, but instead of adding complexity and intrigue and characterization, they just ran with it. The actors are either camping it up or out of their element, the action and shootouts are pretty mundane, and the story is just uninvolving, even for fans of film noir like myself. It’s a good-looking film from a technical standpoint, but that’s as far as I’ll go in my recommendation (it could be an odd pairing with Milk considering the two shared actors). It feels like it just wants the setting elements of film noir, the atmosphere, and then figures just having good guys and bad guys shoot it out will suffice. That glossy, high-sheen period look just seems like a cool façade, and a cool façade seems like the only ambition of Gangster Squad. I can’t really recall any signature action sequence, snappy quote, plot development, or peculiarity worthy of remembering. It may be one of the most forgettable gangster movies Hollywood has produced. Considering the talent in front of and behind the camera, it’s hard not to describe Public Enemies as anything but a letdown. This Depression-era gangster film is heavy on period details and very tight-fisted when it comes to characterization. You’d think given 140 minutes and the natural charisma of Johnny Depp that an audience would come to some kind of understanding with notorious bank robber John Dillinger. Nope. The characters remain perfunctory the entire time, pushed into conflicts by a brisk pace that manages to squeeze in three bank robberies, two prison breaks, and many police shootouts. Because the movie barely takes time to breathe, the love story between Dillinger and Billie Frechette (Oscar-winner Marion Cotillard, a dead ringer for pop singer Katy Perry) is never credible, the tension never feels palpable, and director Michael Mann (Heat, Collateral) seems overly smitten with his distracting high def digital photography. You never really feel any sense of danger or interest. The characters on screen feel like strangers even after 140 minutes. Depp makes the movie more tolerable than it would be without his presence. Mann, one of three credited screenwriters, seems to assume the audience is well versed in Dillinger history and so he skips over plenty of fertile territory. Public Enemies certainly hums with plenty of polish but it comes across as mostly mundane due to such flimsy character work. It’s a collection of good scenes that fail to make up a satisfying whole. This is a wildly overwrought and sleazy drama is hoping to come across as edgy but everything is so overdone. It fulfills all the requisite elements of the modern crime picture; double crosses, forlorn anti-heroes, bloody violence, but Street Kings misses the mark big time when it comes to any nuance. Every beat of this murky, convoluted dirty cops mystery is plain and obvious. If you cannot guess within minutes who the eventual culprits will be then you haven’t seen enough movies. Every character is a cliché of a cliché, every unrestrained actor is constantly speaking in nothing but exclamation marks, and the dialogue is some of the worst I’ve heard all year. Keanu Reeves is a listless leading man who is blank and lifeless, unable to wrestle the dark and complicated emotions needed for a “cop on the edge” role. I can practically feel Forest Whitaker’s spittle every time he speaks. Street Kings feels like a route retread of rogue cop pictures, which are director David Ayer’s specialty. It wants to shine a light on the seedy underbelly of the law but it can’t stop from feeling like a lobotomized version of L.A. Confidential (Note to Ayer: Jay Mohr + mustache = an arrangement that benefits neither party).